ISBN 978-1-937794-14-9 (epub) is available for iPad, Nook, etc. at the Apple iStore (AU, AT, BE, BG, CA, CH, CY, CZ, DE, DK, EE, ES, FI, FR, GR, HU, IE, IT, LV, LT, LU, MT, NL, NO, PL, PT, RO, SE, SK, SI, UK, USA); Barnes & Noble, Goodreads, Kobo, Novel Depot, and Weightless. ISBN 978-1-937794-12-5 (mobi) is available for Kindle on Amazon (BR, CA, DE, ES, FR, IN, IT, JP, UK, USA) and Weightless (worldwide; US currency). ISBN 978-1-937794-13-2 (pdf) is available at Smashwords and Weightless. Discuss this book at Goodreads and LibraryThing. Employing sonnets and sestinas as well as open forms, Measured Extravagance lyrically documents the messiness of grief and explores the complexity of devotion. Peg Duthie celebrates the conflicting demands of journeys as she travels from a Nashville recording studio to a congested street in Prague to the Wall in the Old City of Jerusalem, and introduces us to sharpshooters, scientists, musicians, bakers, the dead and those living on the edges of reality as they romp past boundaries, rage at expectations, and tangle with skepticism and belief. Read this book—and throw jump shots with Shakespeare, play duets with Heisenberg, and find out what relish trays and rifles really have in common. among the starflowers carved from radishes. for both monsters and manners—but it is not all. of preserves and pretenses, a prelude to sustenance. These links all open in a new window. At Youtube, from a reading at the Nashville Public Library on 24 March 2012: “Playing Duets with Heisenberg’s Ghost,” “Schrödinger’s Top Hat,” “The Language of Waiting,” “Deep and Crisp and Even” and “Hymn“; watch together in a playlist. “By Way of Sorrow,” Strange Horizons, 11 January 2010. “Deep and Crisp and Even,” The Dead Mule School of Southern Literature, December 2009. “Kol Nidre” (text and audio). qarrtsiluni, 28 September 2009. “The Language of Waiting” and “Fuel,” The Dead Mule School of Southern Literature, Summer Sabbatical Issue, July 2009. “The Sharpshooter Assembles a Relish Tray” and “A Stack of Cards,” flashquake, Volume 8, Issue 2, Winter 2008/2009. “As She’s Dying,” flashquake, Summer 2008. “A Particular Truth—1941,” Contemporary Rhyme, Volume 4, Issue 4, Fall 2007. Contemporary poetry on Jewish religious subjects is rare in America outside the pages of specialized Jewish publications. Thus, Peg Duthie’s delightful new collection Measured Extravagance (Upper Rubber Boot Books) is doubly welcome… Peg is a poet we must hope to hear more from. — Martin Berman-Gorvine, “A Measured Feast,” InTheMoment, 25 September 2012. Toward the end of the collection we end up in Chicago, England, and Boston in “Between the Hints.” The speaker muses about “what we can make is what // will do for now. . .” Oh how we humans are forever striving! Duthie cleverly twists that idea into all its permutations within the rhymes of this poem’s form, using iambic pentameter and quatrameter so wickedly that the reader doesn’t even realize how smoothly he/she has been schooled. — Christine Klocek-Lim, “Three Poetry Reviews for National Poetry Month,” November Sky Poetry, 28 April 2012. The title appears to be an oxymoron. How can something measured be extravagant? We can ask that question of poetry itself. Taking it to the bard as we shoot hoops, we might ask how it’s possible to seize something as tight and as structured as a sonnet and stuff it full to bursting. The answer… well, the whole book is an answer to that question. We might just as easily ask the same question of life, with its well-defined form and obvious boundaries. How can we live extravagantly within our measured years? In “As She’s Dying”, we meet a mother intent on not living while she was alive: “she/who regarded my writing as a squandering/of time and ovaries.” And in its companion poem, “A Stack of Cards”, we imagine a quiet moment after the funeral, going through the mother’s things, “this mourning of a life you wouldn’t have lived/even if you’d had the heart for it.” Both poems are 13 lines, not rondeaus, sort of deformed sonnets if you like, a bit clipped like the mother they contemplate. A life lived within the measure of its confines is no life at all, but a life lived with extravagance becomes more than the sum of its years. — David Allan Barker, “Review: Measured Extravagance, by Peg Duthie,” Nouspique, 20 April 2012. …it’s a sestina, and a good one! I’m not typically a big fan of form poems—with sestinas about half way through the poem I usually feel like, as a reader, that I can see the writer trying too hard to get those end-words in—but Duthie seamlessly blends them in. — Renee Emerson, “Measured Extravagance by Peg Duthie (a review),” This Quiet Hour, 10 April 2012. What I admire most about this book is Peg Duthie’s masterful treatment of highly politicized topics (such as the political inclinations of well-known scientists) into a non-politically-correct lattice… Measured Extravagance delivers. What a gorgeous collection! — Kristine Ong Muslim, “on Peg Duthie’s ‘Marvelous Extravagance’,” 1 April 2012. I think my favorite, my best delight, in this volume, was ‘Deep and Crisp and Even,’ which title will make those who know me go, well, of course–and it’s got apples and snow and winter, but it’s Peg’s Nashville winter and not my own, parallax again, different views, different angles. I love this. I reread it already. I will reread it again. And sometimes things find you where you are and you don’t entirely wish to say why, and ‘Hymn’ is like that, and if it finds you where you are, too, you will know. Recommended. — Marissa Lingen, “Measured Extravagance, by Peg Duthie,” Barnstorming on an Invisible Segway, 21 March 2012. Entry filed under: Poetry. 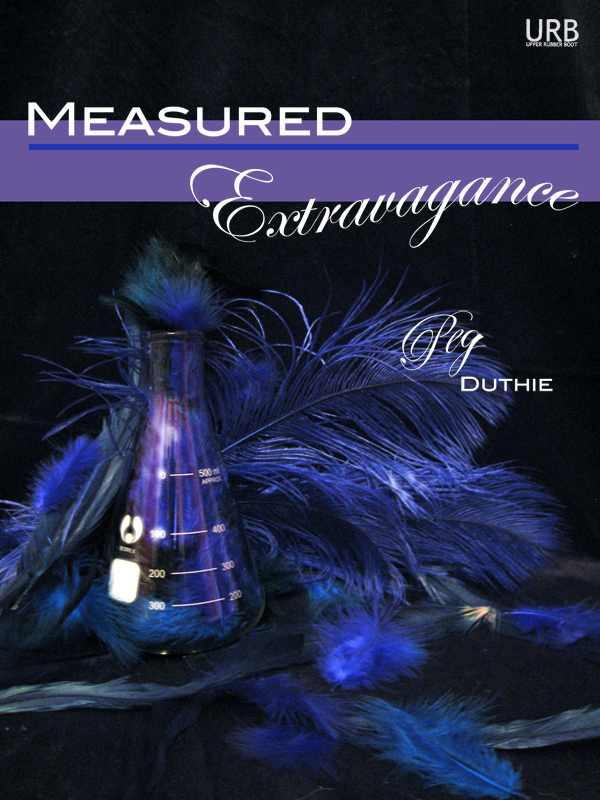 Tags: Measured Extravagance, Peg Duthie.